MYOB Payroll software is a Malaysian payroll system. It has been designed with the same easy-to-use elements found in the award winning MYOB Accounting system. Follow us on a virtual tour of the payroll software with screenshots to help you appreciate its inner workings. As your business grows, managing your payroll can become very complex. You have to deal with employees expecting their pays on time and error-free. As an employer, you are legally bound to ensure that the employees' deductions are correctly computed, and paid over to the respective government body on time. You must also keep up-to-date with the changes in tax rates, and submit the annual return of remuneration within the stipulated time. MYOB Payroll software can assist you to process even the most complex of payrolls, in just minutes. You can generate all the reports you need to comply with management and tax requirements, on a monthly or yearly basis. 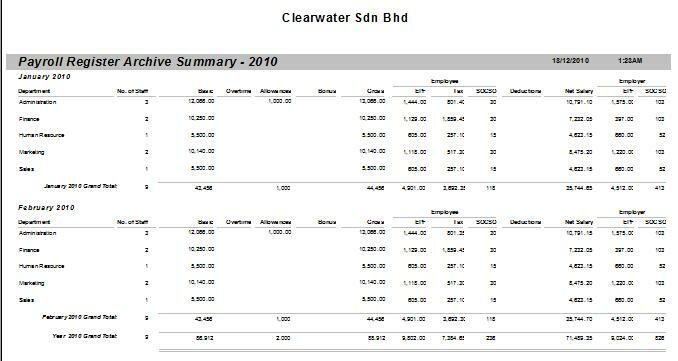 And you can be assured it is compliant with the latest Malaysian PCB 2010 Tax tables. With MYOB payroll, processing of monthly payslip is easy and fast. Processing the monthly pay in MYOB Payroll can be completed in 3 easy steps. Before you process the pay, you would have set the payroll components for the staff. Once you've done that, you can process the monthly pay easily and fast. To process the employee's pay for a month, go to Process Command Centre, click Pay Run. Next, Click New Pay Run button in the PayRun window. The screen will display a list of employees who are eligible to be paid a salary for the month. Select the employee / employees that you want to include in the pay run. You can select by type of employees (permanent, contract, part time etc), by department, or by Cost Centre. 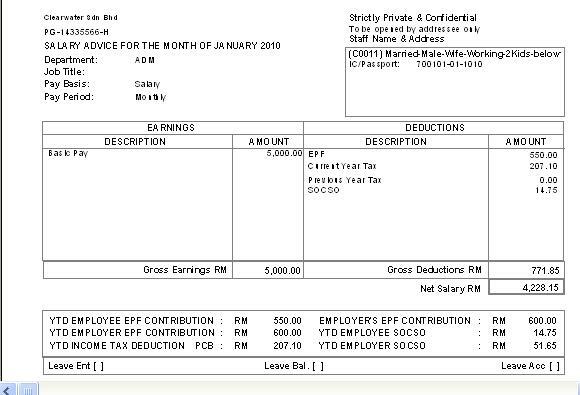 At this stage, MYOB Payroll system would have computed (behind the scenes) the Net Pay due to employees, right down to the EPF, SOCSO and Tax deductions. MYOB has taken the earnings and deductions figures from the Employees' Payroll Details that you have set earlier for each employee. If there are no changes to the employees' payroll details for that month, then you can click the Process button in the Pay Run window. And your month's payroll will be processed in just a couple of minutes. You would need a couple more minutes to print the Payslip and generate the Payroll Summary, and you are done for the month. If a majority of your workforce has fixed earnings components per month, then processing their pay can be done in a relatively short time. 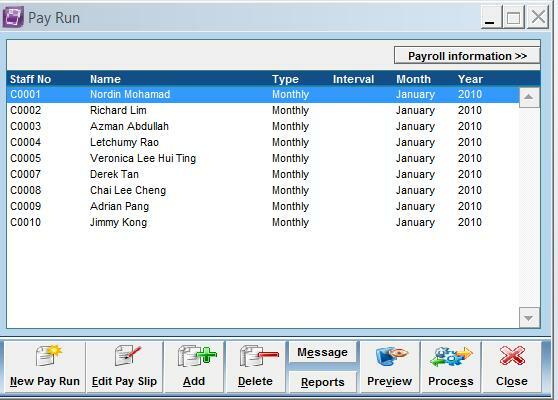 Any time you make changes to the PaySlip (e.g adding a new earnings component such as Overtime pay), the software will re-calculate the EPF, SOCSO, and Tax amounts in real-time manner. 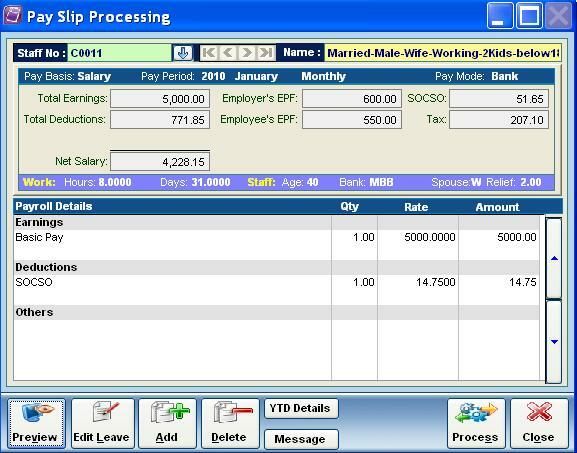 You can click the Preview button to preview the PaySlip in its printed format. Once you are sure of the details, click Process, and MYOB will store the information in its Archive folder. Note : You can also print the payroll reports and get it vetted and approved before you commit to process the Payroll. These reports do not have the words 'archive' on it. If a staff commences work with you sometime during the year, you will need to enter the accumulated earnings, EPF, BIK (benefits in kind) into MYOB Payroll in order to calcualte the current month's STD correctly. Note : Employees need to submit Forms TP1,(Claim for Tax Deductions and Individual Tax Rebates) TP2 (Benefit-in-kind and Value of Living Accomodation), and TP3 (previous employment) to their employers to update the year's accumulated STD. These forms can be downloaded from the Government portal. If you don't have a payroll software installed in your office yet, then you can use the government's e-Kalkulator to compute STD for the staff. The e-Kalkulator aims to accurately compute an individual's tax liability for year of assessment, hence it requires input of information in order to accurately compute an employee's tax. MYOB Payroll have simplified the entire process.